I got a Little Green Bag, 2x Gentle Lentil (one is for my friend), Banana Moon soap, Lemony Flutter (I knew that product before) and Angels On Bare Skin. The Little Green Bag contains: Jungle solid conditioner (I got a sample from Rose Selavy before and I love it! ), Sea Vegetable soap, Squeaky Green shampoo bar (instead of Seanik), Sugar Scrub mini, Each Peach massage bar mini, shampoo bar tin, all packed in a knot-wrap (all that stuff was for 16.95 GBP). IZamówiłam Little Green Bag, 2x Gentle Lentil (jeden dla koleżanki), mydło Banana Moon , Lemony Flutter (znałam ten produkt wcześniej) i Angels On Bare Skin. Little Green Bag zawiera: odżywkę w kostce Jungle (dostałam kiedyś próbkę od Rose Selavy i uwielbiam! ), mydło Sea Vegetable, szampon w kostce Squeaky Green (zamiast Seanik), scrub Sugar Scrub mini, mini kostkę do masażu Each Peach , pudełeczko na szampon, wszystko zapakowane w chustkę (zestaw ten kosztował 16.95 funtów)..
Uwielbiam Lusha:)moze nie wszystko ale znalalazlam spora grupe kosmetykow,ktore pasuja mi idealnie.Zakochana jestem w mydlach Sultana Of Soap-sa rewelacyjne dla mojej skory,plynne szampony,maski,krem do rak…wiele by tego wymieniac. Polecam tez myjadlo Aqua Marina-rewelacja oraz maske Catastrophe Cosmetic. Jak Ci się sprawdza Lemony Flutter? Nice. I use the Lemony Flutter myself. I’ve tried the Jungle conditioner but my hair is long and thick and it was too light to remotely condition my hair – still it was nice. And I have tried 2 different solid hair shampoos – which I like this product a lot. ENJOY your order. 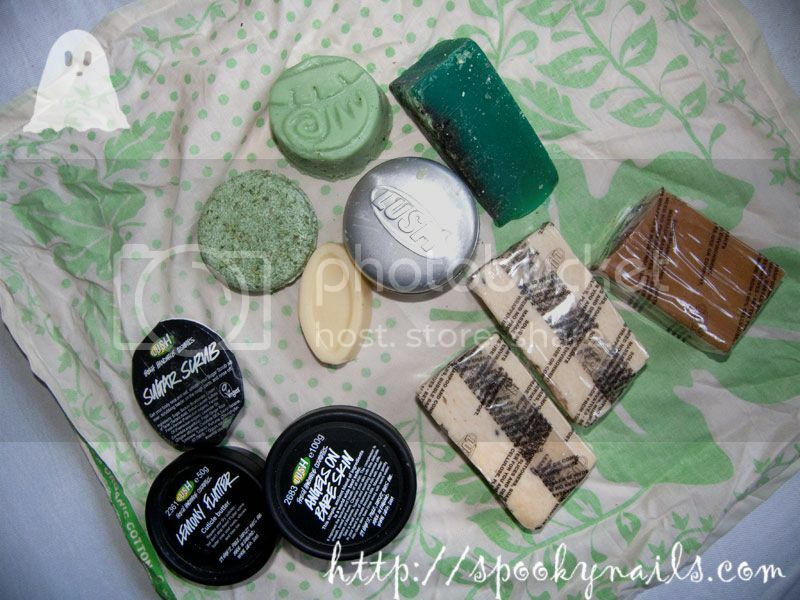 Nice love the haul – im using a Karma soap atm – its my first lush purchase shockingly….im addicted! everything for £16?? That’s really cheap! Was it a deal?